one happy little crafter: Growing old is gonna happen....growing up is optional!! Growing old is gonna happen....growing up is optional!! Hi all, hope you're all having a great week, its been a busy week at work for me so not had a lot of time to blog, have been making quite a few cards though, as we have been doing a bit of fundraising for Epilepsy Awareness, so I have left a box of cards in our canteen, and have so far sold quite a few and got a couple of orders....yay! Did want to share one card with you, and that is a birthday card I made for one of my very good friends at work, who turned 40 this week, and as a recent recriut to the 40's club myself, it is a standing joke between us that just 'cause we're getting older, we're not ready to get too old yet, lol. The quality of the photo is a bit pants, but as we're not really enjoying the best light at the moment that is unsurprising! Happy to report that she thought it was wonderful! Fabulous card Lisa. I love that image, the papers and colours are gorgeous and such a great senitment too. 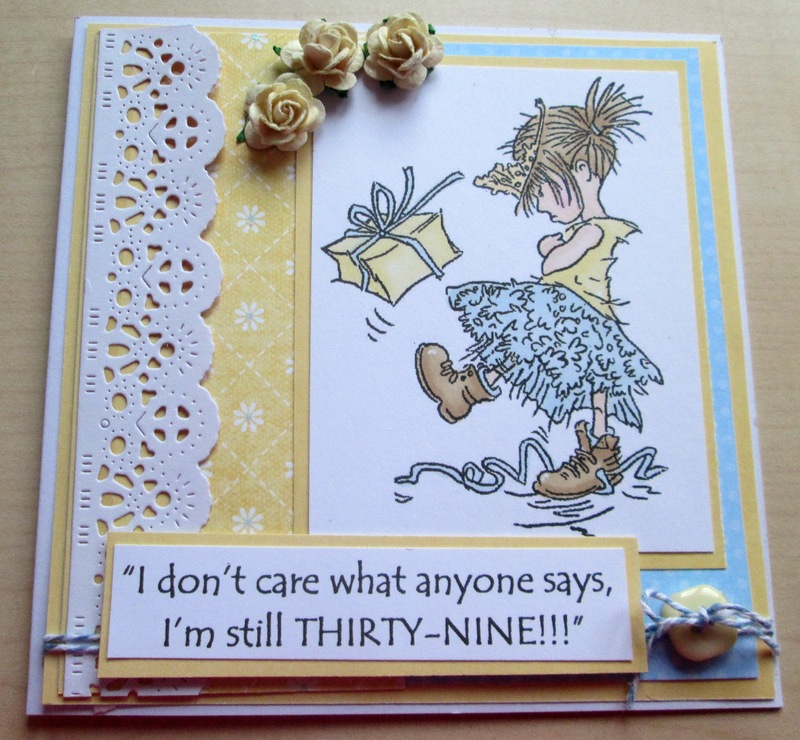 Cute card, great sentiment! Glad you joined us at Sweet Stampin'. Super card Lisa. Great image and the sentiment made me smile. Brilliant card, such a great sentiment ! This is so fun! What a great sentiment for your 40-year old friend. I love that wonderful border too. It's gorgeous! Fantastic card:) The image is so adorable and just love the F*U*N sentiment! What a fun card and I love the sentiment. Thanks for playing along this week at Cheery Lynn Designs. This is just the cutest thing ever! I love the image and the flowers! Thanks for playing at My Craft Spot.